Photo etching is an interesting process where you start with a photograph, have film negatives made, and then use that to control exposure of a light-sensitive material to, well, light. Then it’s done like normal etching, except the parts where the light hit are more solid, so they don’t dissolve, and you’re left with the positive image eaten away, all ready to take ink. My model at the time asked to have his back painted to try out his idea for a tiger stripes tattoo, so I got ink and a sumi-e brush and painted him up and took photos. I’ve had a chance to use those images for several things, including this piece. 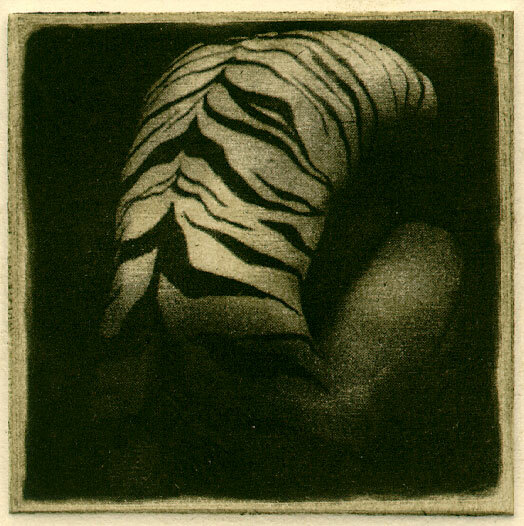 Animal Instincts, 3″x3″ photo etching, $199 with free shipping. This was printed in an edition of 26, of which I still have 4 + 1 with tea stains (oops). These prints are on thick watercolor paper, but aren’t really suitable for display as is. I’m happy to frame it for you for a wee extra fee, though.